RSVP and Survey Pages are built in Modern Editor and have unique form blocks for collecting responses and submitting responses. RSVP and Survey pages contain required blocks for submitting responses. These blocks cannot be deleted. Move the blocks to a new location if needed and use styles to customize the design. If you move the required blocks into another container (such as a two-column or other structural block), that container cannot be deleted. Move the required blocks out of the container to be able to delete the container. The Submit Button form block style uses separate styles than single button blocks. 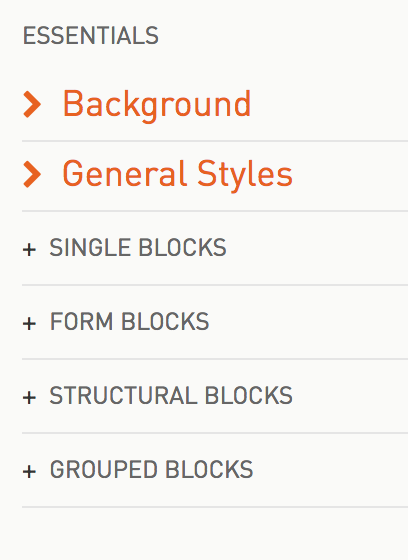 You can edit your Submit Button form block styles in the main STYLESHEET. 1. Go to STYLESHEET > FORM BLOCKS. 2. Select the Submit Button form block. 3. Modify the styles here to update Submit button styles globally. RSVP Page Yes / No buttons can only be changed from the preview panel. 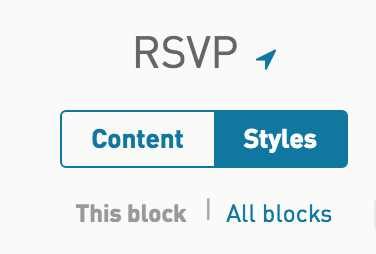 Click on the RSVP block to access the edit content panel on the left side where you can make changes to the block styles. 1. Click on the RSVP block from the preview panel (right side). 2. Click on STYLES from the edit content panel (left side). 3. Modify the styles for the Yes / No Button elements. The RSVP Yes/No button check mark (selected state) is white. Use another background color to change the color; for example, gray or black or another appropriate color. 3. Select the Yes/No Buttons Checked element. 4. Select a Background color. RSVP and Survey Pages both have captcha blocks. reCaptcha is a service from Google that helps protect our Pages from spam and abuse. The captcha form will ask the user more questions the more suspicious it is. Radio form blocks let you set up a list of choices where there is only one answer to select. The choices are exclusive; when a radio button is selected, any previously selected radio button becomes deselected. In the open Answers field where you see "option 1, option 2, option 3", you can edit these options to your selections and add new options by hitting enter (return) on your keyboard to type in the next option. 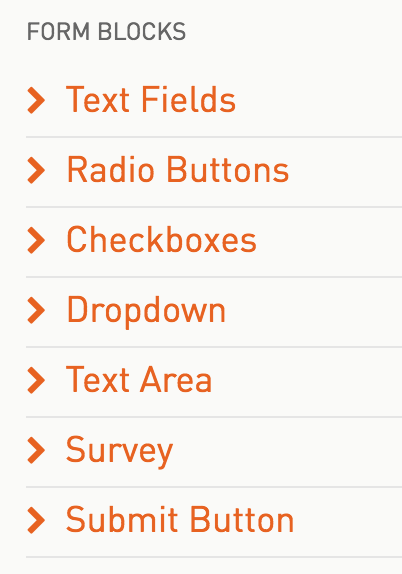 You can edit the CSS to design the radio options into two columns. Select the CSS tab in the lower left corner of the editor (or access the CSS window from your form block STYLES). Follow the instructions in this guide to add CSS3 columns: Using multi-column layouts. 1. Go to the STYLESHEET tab (left side). 4. Open the Radio button element. 5. Open Adjust spacing and adjust margin. 1. Select the Form block from the preview panel (right side). 2. Click on STYLES (this will default to This block). 3. Select the Radio button element. 4. Open Adjust spacing and adjust margin. Checkbox form blocks let you set up a list of choices where there may be multiple options to select for the answer. The choices are not mutually exclusive. 4. Open the Checkbox element. 3. Select the Checkbox element. Dropdown form blocks let you set up a list of choices where there is only one answer to select. The choices are exclusive; when a value is selected, any previously selected list value is no longer selected. The answer will display in the dropdown placeholder once selected. Survey form blocks are set to 5 answers only and cannot be increased or decreased. Toggle answers to Disagree-Agree or 1-5. Edit the answer fields to your desired information by typing in anything else you prefer. Only one answer is possible. Text area form blocks have a maxlength setting. Set this to the highest character length you will allow. Each character is equal to 1. For example, if you allow 250 characters this includes any spaces and punctuation. Text field form blocks collect different types of data that must be typed into the open text field. Data includes dates, email, number, phone, text, time or a URL. Each field has it's own built-in validation. Set a field to required or not. (Optional) On select fields write a regular expression for the data validation. Date: Show a date picker. Use-case, collect a birthday date. Email: Collect an email address. Number: Open text field for a number value. Phone: Open text field for a phone number. Use-case, collect a home or mobile contact number. Text: Collect text. Use-case, best for short text. Use a Text area form block for longer areas of text. Time: Show a time picker. Use-case, collect the best time for a follow up call. Date and time text field form blocks aren't supported everywhere and will display as open text fields in these cases. Use maxlength to set a limit on how much text can be added and use placeholder or question text to show the format requested. For example, if asking for a date, show a preferred date format as the placeholder text (Ex, mm/dd/yyyy). If you want to collect a date that is just a month, use Text Field Form > Type > Text. Enter Month in the Placeholder field and set a maxlength. (Optional) You can write a regular expression pattern to ensure accuracy for some of the fields. Example, write a regular expression for email type to check that the email contains a valid top-level domain and no spaces in the address portion. Or, write a regular expression to make sure a phone number contains dashes. Set maxlength to the highest character length you will allow a user to input. Each character is equal to 1. For example, if you allow 250 characters this includes any spaces and punctuation.